Smith & Nephew Opsite™ Flexifex™ Transparent Film Roll is a roll of transparent adhesive film that has been designed to allow easy application of the film to awkward areas of the body and over dressings and tubes. It is waterproof and provides excellent adherence, even while the patient is bathing. Smith & Nephew Opsite™ Flexifex™ Transparent Film Roll is highly conformable and extensible. Aids in prevention of bacterial contamination, reducing risk of secondary infection. Acrylic adhesive minimizes the risk of skin damage. 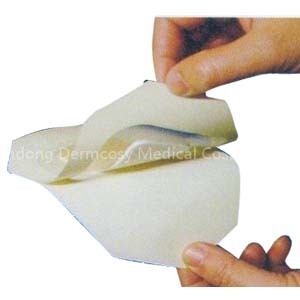 Cutimed Siltec Foam Dressing, Heel 2D 6.5" x 9.5"